Need some places to take the family this April, without busting the budget? Save your money for Easter eggs with these fantastic, FREE family events in Perth in April. As one of the state's leading festivals, the Joondalup Festival is three fun-packed and FREE days of live entertainment and alfresco dining. Taking place from Friday, 5th April to Sunday, 7th April, the festival is known for its daring lineup of events, innovative artists and dazzling performances. This year's show will feature an act for everyone, including circus shows, music, comedy, children's shows and oversized, interactive art installations. For more details, visit the website. Bring the family along to the Open Gardens Family Fun Day in the Garden and learn more about how to get the most out of your flora. This event is free and open to anyone with an interest in gardening. You can hear from celebrity gardener Sophie Thomson and learn more about sustainable living from Earthwise sustainable gardener Peg Davies, plus the kids can take part in some fantastic activities. You can read more here. Take a trip around the world without leaving Perth! The Subiaco Street is Subi's biggest annual community event and this year's theme is 'Around the World.' The event will celebrate cultural experiences from the Americas, the Mediterranean, Asia and Down Under. Take part in interactive workshops, kids activities, sample the food trucks, pop up bars and see live performances. The Street Party is pet-friendly, thanks to charity partners Dogs' Refuge Home of WA and Cat Haven WA. Beeliar Community Voice Inc is bringing the Twilight Markets to Radonich Park in Beeliar - enjoy a variety of bites from food trucks, gifts and produce from market stalls and hear live music from the WA Samba Band. Come and browse the Beeliar Creative Kids market stalls and speak to local services and sports groups who can let you know what is available around the community. Sports groups and local services will be there to let you know what's available around the community. Secret Harbour's favourite, free annual community event will feature heaps of fun activities, including Easter crafts, market stalls, free activities for children and even a visit from the Easter bunny! There will also be a meet and greet with Alice and the Mad Hatter, plus amusement rides, petting zoo, face painting and live entertainment. There will also be gourmet food vans, show bags and more! Read more here. Located at the Heathcote Cultural Precinct, this Makers Market is one of the best family markets around, mainly because of its close proximity to the AWESOME pirate ship playground at the reserve. Along with over 150 stalls to browse, there will also be giant garden games, live entertainment and plenty of food and drink! Ok, yes, I know what you are thinking - can you really take your child to the recycle centre for a family day out?? Umm, YES! My children are only 1 and 3 and already LOVE recycling, so why not show them where the bits and pieces they are always helping to put in the yellow-lid bin are going? We are, after all, raising the next generation of people who will be caring for our planet, so it's never a bad idea to help children understand where our waste goes and encourage them to recycle and practice sustainability. Children must be aged 6 and over to attend so, unfortunately, mine are too young this time! Stoked Festival is a free event suitable for all ages! This all-day event is an immersive spectacle inspired by 90 years of Midland Rail Workshops from 1904 to 1994. 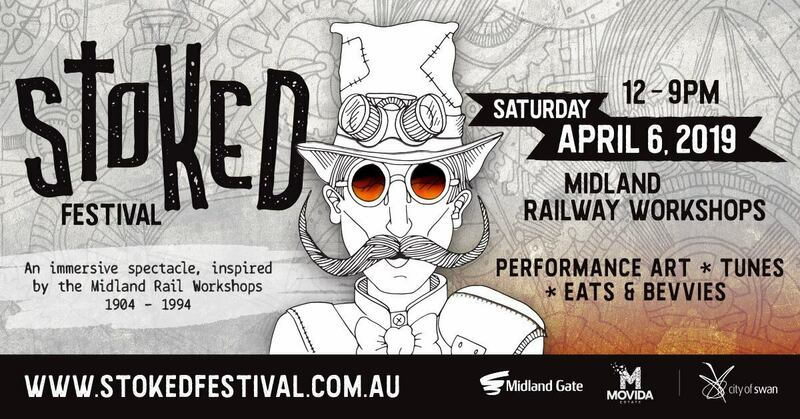 Stoked Festival will feature contemporary performances, music, food and beverage and magnificent machines lovingly restored from across the years. Read more here. 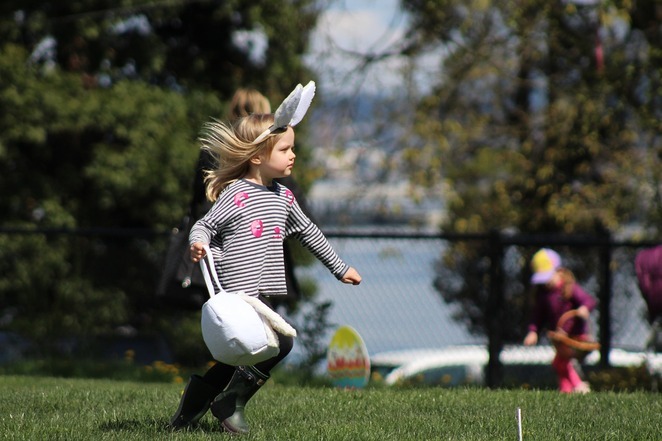 This year, Easter falls in April, so there are a number of FREE Easter Egg Hunts happening around. Here is a list of just some of the hunts taking place in Perth. So get cracking this April and save your hard-earned dollars for another packet of delicious chocolate eggs by attending these fantastic free events.